Drivers are advised to take extra care on the North West’s road network from Wednesday morning, with wind speeds expected to reach 70mph. 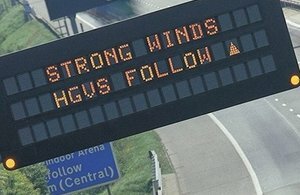 The Highways Agency has issued a severe weather alert for gales from 8am on Wednesday 10 December until 9am on Thursday 11 December. Gusts of over 50mph are expected along the coast and over the Pennines from sunrise on Wednesday, with winds strengthening throughout the morning up to 70mph. Hail, sleet and snow showers are also forecast, especially over the higher Pennine routes, where drivers can expect blizzard conditions. Visibility will be significantly reduced during the showers and also from the spray. We’re expecting high winds across the region from Wednesday morning so we’re urging motorists to allow extra time for their journeys and to drive at appropriate speeds. If your journey isn’t essential then it may be better to travel at a different time, especially if you’re driving a lorry, caravan or motorbike as these vehicles are particularly vulnerable in high winds. Drivers should also check fuel and fluid levels, electrics and tyres before setting off to make sure their vehicles are as safe as possible. Road users should check their journeys before they travel by listening to traffic bulletins on the radio, visiting www.highways.gov.uk/traffic or calling the Highways Agency Information Line on 0300 123 5000. See Highways Agency advice on the Get Ready for Winter website, alongside weather information and traffic updates. Regular winter updates will also be available via the Agency’s winter social media channels, Facebook and Twitter.